Ancient and Primeval Beech Forests of the Carpathians and Other Regions of Europe - extension (Czechia) is part of the Tentative list of Czechia in order to qualify for inclusion in the World Heritage List. 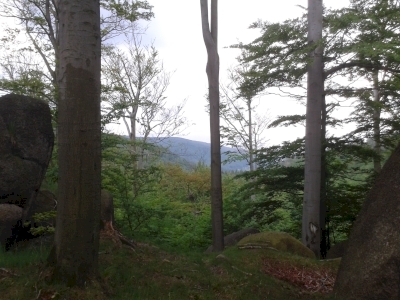 First, I was in shock when I found out that the beech forests of Jizerské hory Mountains are to be included to the giant project of Ancient and Primeval Forests of Europe. Now, I like this nomination more and more. "Jizerské hory" are located in the fromer Sudetenland in northern part of Czechia. Although this part of Czechia is very interesting, it was heavily afected in the last century: (i) Once highly developed region with textile and glass industry (bijouterie/imitation jewelry from Jablonec nad Nisou was world famous with quality that Swarovski can only dream about) were turned into "not such developed region" by an expulsion of German minority after WWII, and this is visible even today. (ii) In 80-90s of 20th century, the large pine forest areas of Jizerské hory and Krušné hory (Erzgebirge) were killed by sulphur- and nitrogen-oxides air pollution from heavy industry of Czechoslovakia, Poland, and East Germany. Thus, this is a region of big contrasts. The forests in the area are mostly regenerated, so, do not expect disastrous place nowadays. The Jizerské mountains are formed by large mountainous plateau that together with one of the highest rainfall in Europe results in very fine peat-bogs. Another natural curiosity is one of the finest deposite of sapphire and related precious stones, such as iserine (named after Jizerka) in Europe. It is in Jizerka plateau - a beautiful place of worth-visiting!. Due to their shape, the Mountains are famous also for cross-country skiing. There is the annual race "Jizerská padesátka" (meaning 50km long race) with tradition over 50 years. The large beech forests are located on the rocky northern edge of the plateau, and can be reached for example from the pilgrim place Hejnice with interesting baroque church. One can see there the viewpoint Ořešník on the granite rock accesible by red tourist trail (photo - a gorge close to Ořešník viewpoint). The beech forest of the National reserve are one of the finest in Czechia, but I think that the area is only little know for that. Fortunately, beech trees are more resistant to polution than pine forests. To conclude, this site would be a good addition to the WHS and I support the inscription.